The pickup artists in Neil Strauss's The Game aren't a patch on Shakespeare's Richard III. In the play's second scene, which takes place at the funeral of a man he murdered, Richard seduces the widow of a man he helped murder. The scene begins with Lady Anne following her father-in-law Henry VI's funeral procession. She tells the pallbearers to set down the corpse so she can mourn this saintly king, but her laments soon turn into violent curses for Henry's murderer, Richard Gloucester, who with his brothers also killed Anne's husband Edward. When Anne finishes cursing Richard—for the moment—she tells the pallbearers to pick up the coffin. Richard appears and orders them to set it down. As the corpse's wounds bleed afresh—a victim's wounds were thought to do this near his murderer—Anne rages at Richard, calling him a "fiend," a "devil," and a "minister of hell." Around 150 lines later, she accepts his ring and agrees to go to his house. Her seduction is the most dramatic turnabout in a Shakespeare play. Its only real competition is act three, scene three, of Othello, in which the villain turns a loving husband into a monster ready to murder his wife, a metamorphosis that takes more than twice as many lines. In his 1955 film, Laurence Olivier makes this tremendously dramatic scene even more dramatic by changing its location from the funeral procession of Anne's father-in-law to the funeral procession and grave of her husband, which is in a palace courtyard. We learn about the first change in the film's first soliloquy. Using lines from The Third Part of Henry VI, the play that precedes Richard III in Shakespeare's first history play tetralogy, Olivier's Richard describes his skill at dissembling and dismisses the idea that he will have trouble gaining the crown. "Tut," he says, flipping his scarf over his shoulder, "were it further off I'd pluck it down" (3.2.194-96). Meantime, I'll marry with the Lady Anne. To cross me from the golden time I look for. Like other speeches in the film, this one sometimes paraphrases Shakespeare's words, sometimes quotes them exactly but changes their meaning, and sometimes radically relocates them. Only the first line comes from where it would in the play, from the end of the scene preceding Anne's seduction. Though it sounds Shakespearean—with its initial "Meantime" and perfect iambic pentameter (for those who've forgotten or never knew, that's ten syllables with an accent on every second syllable)— the line paraphrases "For then I'll marry Warwick's youngest daughter" (1.2.153). The revision allows Olivier to introduce Anne without confusing the audience by dragging in her father. His second line echoes one from the soliloquy that follows the seduction in the play: before the concluding couplet, Richard says that after burying Henry VI, he will return, "lamenting to [his] love" Anne (1.2.248). The same soliloquy supplies Olivier with his third through seventh lines. The third is a paraphrase, the others exact quotes (1.2.228-29, 235). The last two lines come from The Third Part of Henry VI (3.2.126-27), where they refer to Richard's brother, not Anne's husband. In the original, Richard wishes his brother had venereal disease so he wouldn't produce more children who could stand between Richard and the throne. Olivier changes the gender ("his loins" to "her loins") and the tense ("may spring" to "might spring") to turn Richard's evil wish for his brother into the reason he murdered Anne's husband. Nowhere in Shakespeare does Richard say this was why he killed Prince Edward. At the Battle of Tewksbury, Richard and his brothers captured Edward and Edward's mother Margaret of Anjou; when Edward defied them, they cruelly stabbed him to death in front of his mother. The recontextualized lines turn this horrifying but spontaneous war crime into something more like the murder of the little princes. Olivier's Richard murdered Edward to keep him from having children. He tries to seduce Edward's widow beside his perforated body and succeeds in seducing her at his tomb, which Olivier relocates to the courtyard of a palace, a change that allows him to end the scene more dramatically than in the play. In the original, Anne accepts Richard's ring and agrees to meet him at his house. When he asks her to bid him farewell, she can't bring herself to say "fare well" and so says, "Imagine I have said farewell already" (1.2.212). She leaves, and Richard crows triumphantly, "Was ever woman in this humor wooed? / Was ever woman in this humor won?" (1.2.215-16). He soliloquizes about his seductive prowess and new status as a successful lover, finishing by saying he will buy flashy clothes and a mirror (a glass): "Shine out fair sun, till have bought a glass / That I may see my shadow as I pass" (1.2.249-50). 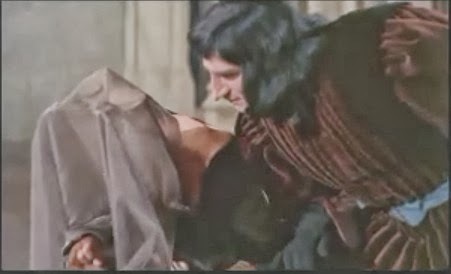 In the film, William's Walton's sweetly sad and sinister music plays as Richard puts his arms around Claire Bloom's Anne then slides the ring over her finger. When Richard asks her to bid him farewell, she turns as if hypnotized and kisses him. She starts to leave, but Richard pulls her to him for another kiss. Anne walks, stunned, into a room that opens onto the courtyard, and, after Richard soliloquizes, he follows her in. We see his shadow—which appears throughout the film, a clever actualizing of Shakespeare's imagery—extend from door to the bottom of Anne's dress. In front of her is a bed that tells us little time will pass between the scene's end and the consummation of their relationship.